Hazrat Haji Peer Syed Farough Ahmed Chishty, Chief Moallim & Gaddi Nashin (key Holder & Caretaker) of Ajmer Sharif Dargah India,will be arriving in Yorkshire, UK, Insha-Allah Tuesday 3rd April. Their personal number in the Country will be : 07784043022 or 07424053473. They will be visiting Birmingham, Bradford, Halifax. Please contact given number for further details. 13th Rajab 1439 Hijri ( Sunday 1st April 2018) Wiladat of Hazrat Maula Ali Mushkil Khusha (Karam Allah Wajhu). Alī ibn Abī Ṭālib ; 13th Rajab, 22 or 16 BH – 21st Ramaḍān, 40 AH; was the cousin and son-in-law of the final prophet Muhammad (PBUT), ruling over the Islamic Caliphate from 656 to 661. A son of Abu Talib, Hazrath Ali (Karam Allah-Wajhu) was also the first male convert to Islam. Sufis consider Hazrat Ali (Karam Allah-Wajhu) the fourth and final of the Rashideen (Rightly guided Caliphs). His father was Abu Talib and his mother was Fatima bint Asad, but he was raised in the household of Prophet Muhammad (PBUT), who themselves were raised by Abu Talib, Muhammad’s (PBUT) uncle, and Hazrat Ali (Karam Allah-Wajhu)’s father. When prophet Muhammad (PBUT) reported receiving a divine revelation, Hazrat Ali (Karam Allah-Wajhu) was the first male to accept his message, dedicating his life to the cause of Islam. Hazrat Ali (Karam Allah-Wajhu) migrated to Medina shortly after Prophet Muhammad (PBUT) did. Once there Prophet Muhammad (PBUT) told Hazrat Ali (Karam Allah-Wajhu) that God had ordered him to give his daughter, Fatimah, to Hazrat Ali (Karam Allah-Wajhu) in marriage. 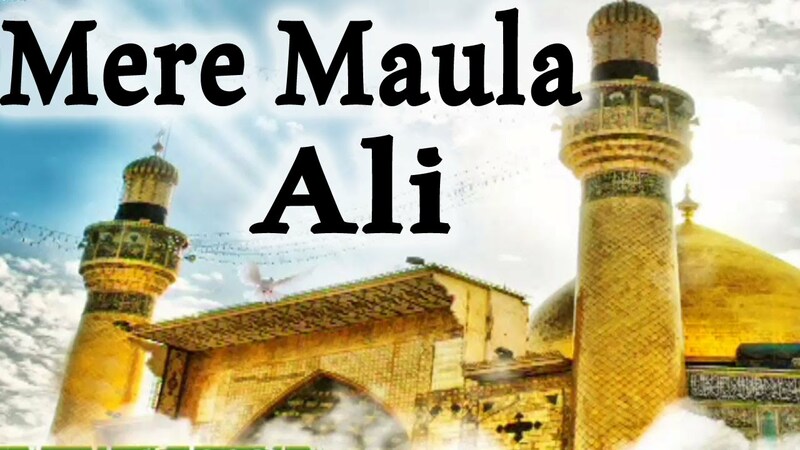 Hazrat Ali (Karam Allah-Wajhu) was appointed Caliph by the Companions (the Sahaba) of Prophet Muhammad (PBUT) in Medina after the assassination of the third caliph, Uthman ibn Affan. Urs of Hazrath Khwaja Hussamuddin Chishty (R.A) Sambhar Sharif -INDIA -Rajab 1439 Hijri. External View of Dargah Sharif at Sambhar Sharif. For those who want to go there: On the ‘Jaipur – Ajmer Highway’ comes a village ‘DUDU’ – that is where you enter and proceed to the village ‘Naraina’ and then comes Sambhar Sharif- it’s about 30 – 40 kms inside from ‘dudu’ but it takes about an hour to get there.. Indeed they are very fortunate who get ‘called’ there! Urs: 13-14 Rajab. The Shrine of Khwaja Hisamuddin Jigar Sokhta (R.A.) the grand son of Hazrat Khwaja Moinuddin Chishty (R.A.) is located on Dudu road about 100 Kms. away from Ajmer. This video is provided by third party thus we have no control over the quality. 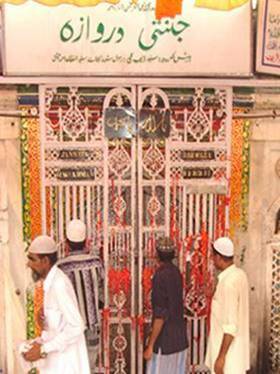 Jannati Darwaza of Ajmer Sharif will be open 1st Rajab – 6th Rajab 1439 H.This is approx 19th March 2018, 1439 H .
On the west of the tomb of Khwaja Gharib Nawaz (R.A) and marble screened enclosure, the Jannati Darwaza is situated, which has silver coated shutters. It is said that whosoever performs the act of crossing the gate towards the holy tomb and then walking along the said of the marble wall emerges into the open courtyard through the exit door on the south and then continuously the walk keep to the right reaches the Jannati Darwaza and repeat the performance six times (this gate should be crossed seven times only) is sure to secure a place for himself in heaven. These seven rounds should be at one stretch. The Jannati Darwaza is opened four times a year. The next Chattie sharif day falls on: 6th, Rajab 1439H , This is on Approx: Sunday 25th March 2018. Depending on the Lunar date of your country. His titles are Qutubul Aqtab and Qutbud Deen. He is also known by the titles Shama’ Sufiyan (The Candle of the Sufis) and Chiragh-e-Chishtiyan (The Lamp of the Chishtis). He was born in the year 430 Hijri and was a Husaini Sayyid. His father was Khwajah Abu Yusuf from whom he had received the mantle of Khilaafate. By the age of 7 years he was a Hafiz of the Qur’aan and at 16 he had completed the course of Uloom-e-Zaahiriyyah. It was during this time (after completion of his academic career) that he wrote the kitaabs, Minhajul Aarifeen and Khulasatush Shariat. When he was 29 years, his father died. He discharged the right of his father’s office commendably in guiding mankind. So numerous were the people who flocked to him for spiritual and moral guidance that his khulafaa alone numbered ten thousand while his mureedeen were countless. He had acquired the miracle of Tay’ul Ardh (i.e. to traverse great distances in moments). When he wished to perform tawaaf, he would in moments be miraculously in Makkah Mukarramah. He associated much with the Fuqara, never wearing beautiful garments. The degree of his tawaadhu (humility) was exceptionally lofty in perfection. He was always the first to initiate Salaam and he would stand in honour of every person. After a few days, the prince was arrested for some crime and his eyes were taken out. It is impossible to enumerate Khwajah Maudood’s Khulafaa. For the sake of barkat, a few are mentioned hereunder. Khwajah Abu Ahmad, Khwajah Shareef Zandani, Shah Sanjan, Shaikh Abu Naseer Shakeeban, Shaikh Hasan Tibti, Shaikh Ahmad Baderoon, Khwajah Sabz Paush, Shaikh Uthman Awwal and Khwajah Abul Hasan. Among them, the link in this (Chishti) Silsilah is Khwajah Shareef Zandani who will soon be discussed. Shaikh Maudood passed away in the beginning of Rajab 427 Hijri at the age of 97 years. His first Janaazah Salaat was performed by invisible (ghaib) men. Thereafter the general public performed the Janaazah Salaat. After the Janaazah Salaat, the Janaazah of its own accord, moved in mid-air. Seeing this miraculous event of Khwajah Maudood, numerous people accepted Islam. His grave is in Chisht in Afghanistan. His title was Waliyud Deen or Naasihud Deen. He was a born wali. During his mother’s pregnancy, the sound of Thikrullah could be heard from her body. He was a Syed, being a descendent of Hazrat Hasan Ibne Ali (A.S). He was born in Muharram 331 Hijri. At the time of birth he recited the Kalimah seven times. Even while being breast-fed, he engaged in Thikrullah. In infancy he would raise his eyes upwards to the heavens at the five Salaat times and recite the Kalimah in abundance. When a non-Muslim would come to witness this phenomenon, he would accept Islam. His father had gained the mantle of khilaafate from Khwaja Abu Ahmad. At the age of 7 he became bay’t and until the age of 12 he lived alone in a room. Every day he fasted. He practiced mujaahadah excessively. But because of her engrossment in thikrullah, she refused. After a few days she saw in a dream her father giving her the same instruction. Muhammad Sam’an with whom her nikah was destined also saw a similar dream. Even Khwaja Abu Muhammad saw this dream. Finally, the nikah was performed in the morning. Khwaja Abu Yusuf who is the Khalifah of Shaikh Abu Muhammad was born of this union. At the age of 70 years he was divinely inspired to join Sultan Mahmْood Ghaznawi in the Jihaad against Somnath (in India). Taking a few Mureedeen with, he joined in the battle field. Hazrat Shaikh passed away on the 4th Rabiul Awwal or in the beginning of Rajab in the year 411 Hijri at the age of 80. His grave is in Chishty. Khwajah Abu Yusuf, Khwaja Muhammad Kaku and Khwaja Ustad Marwan were his khulafaa.